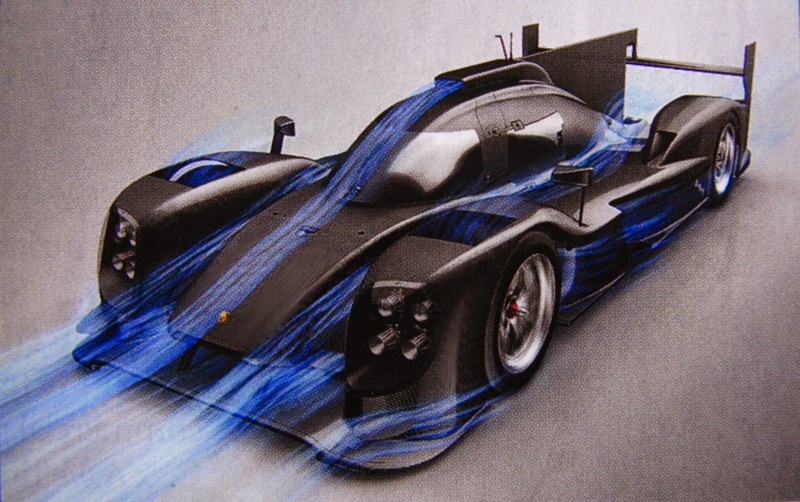 It turns out this design has over 2000 hours in a wind tunnel tweaking the airflow. 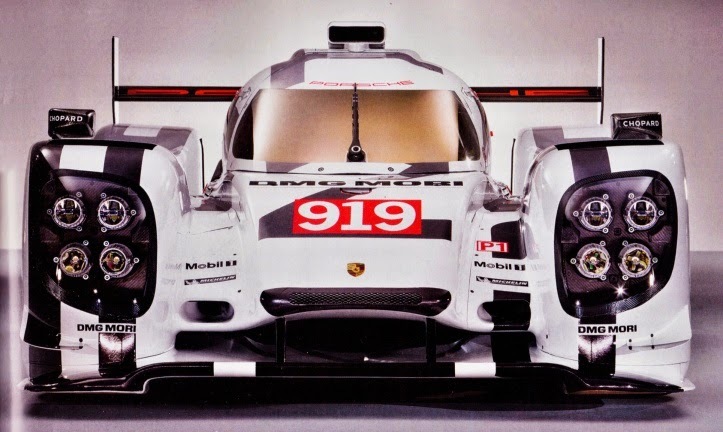 Aside from steeper leading surfaces and more gradually sloped trailing surfaces, it is not the 1930's classical smooth teardrop shape, it is discrete sections where the airflow is shaped piece by piece for different requirements along the car. 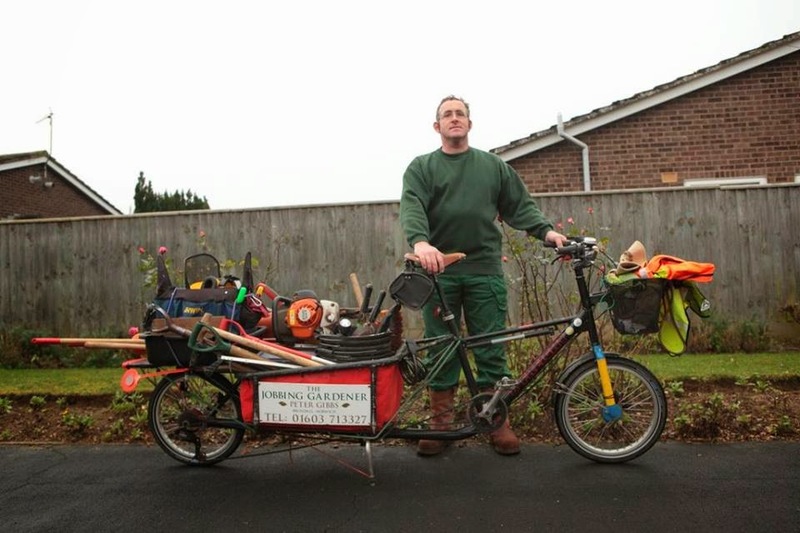 Because of their odd shapes, I think the same methodology can also be applied to cargo bikes. From the front it is easy to see the fenders are just big enough to cover the tires (no turning the tires sharply! ), the cockpit is just enough for the driver, and instead of fairing in a smooth bodywork between the two, the body has been dropped down to just cover the suspension links. The emphasis is on minimizing the frontal area, and smooth, continuous, streamlined shapes are secondary. Streamlining works best in laminar air, not so well in traffic or off axis gusts, while minimal area works all the time. 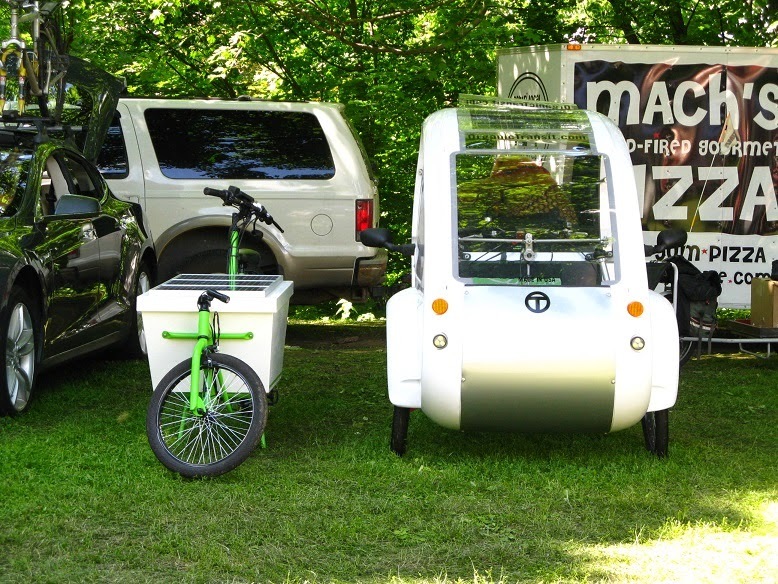 Twike, original body with human power + electric on left, and newer TW4XP all electric at right. Note that the human powered Twike has motorcycle tires, and the TW4XP has car tires- load capacity and rolling resistance will be roughly proportional to tire size (working air pressure, tread design and compound, and carcase construction also come into play). The base 10 Ah x 384 Volt battery pack in the original Twike is good for 75 km, or 82 Wh per mile. Using the Wh/m consumption figures to indicate relative drag/rolling resistance, this is 6.2 times as much energy use as my solar electric Bakfiets at 13.2 Wh/m, which I have found is okay to pedal on level flats, but I prefer to use the electric drive going up hills. The new Longtail seems to be using about 16-18 Wh/m average, and I can pedal it along a flat up to about 1/3 mile, and then the drag starts to be a little bit tiring and I use the motor. You probably won't pedal the Twike very far without turning on the motor, (see The Hyper-Efficient TWIKE Human-Electric Hybrid Vehicle, Treehugger for a review), and this means it's range is the battery range. I haven't found performance figures for the TW4XP, but it was designed for the Progressive Insurance Automotive X Prize which had a contest minimum requirement of 100 mpg, or maximum energy use of 330 Watt hours per mile, and it does not have pedals. 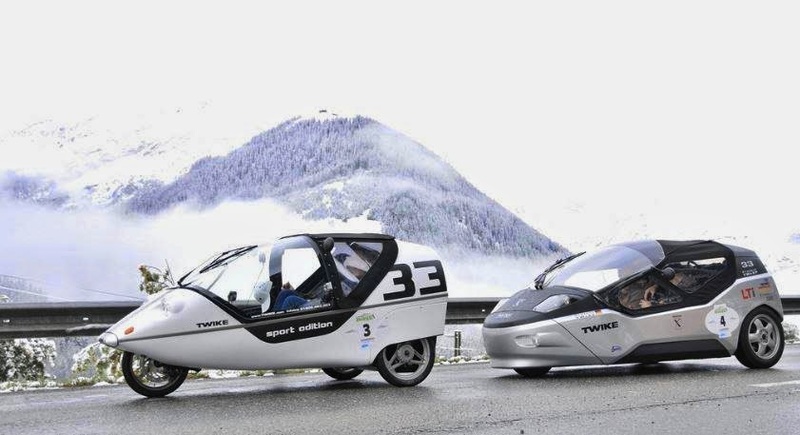 My estimate is 2 to 2.5 times the energy use of the original Twike, or 160 to 200 Wh/m. 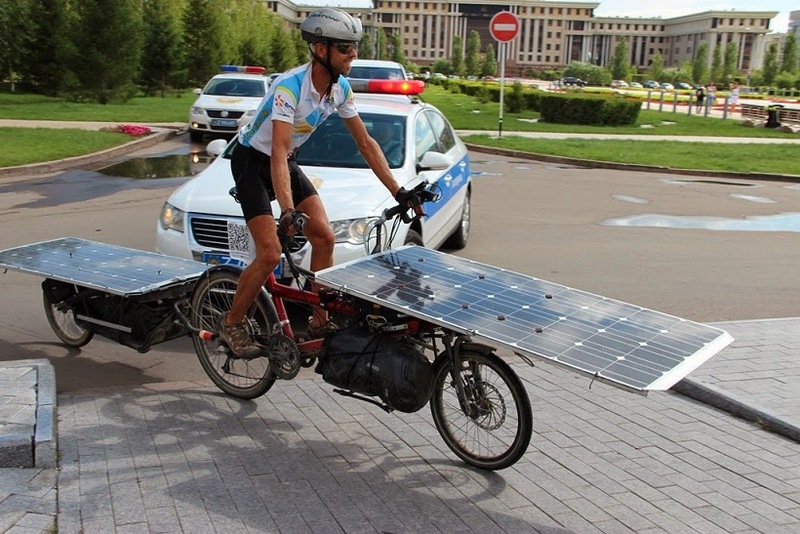 These levels of energy use will not work well with mobile solar, or for people pedaling with limited physical capacity. Fabric side skirts can be fitted for water protection. Nice fit of the hood over the front wheel, but headroom might be a little tight. 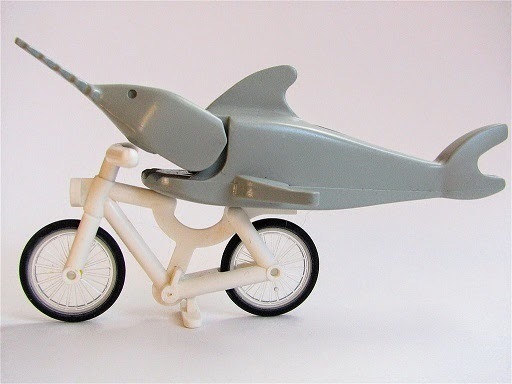 Another version of a streamlined body on a bicycle. 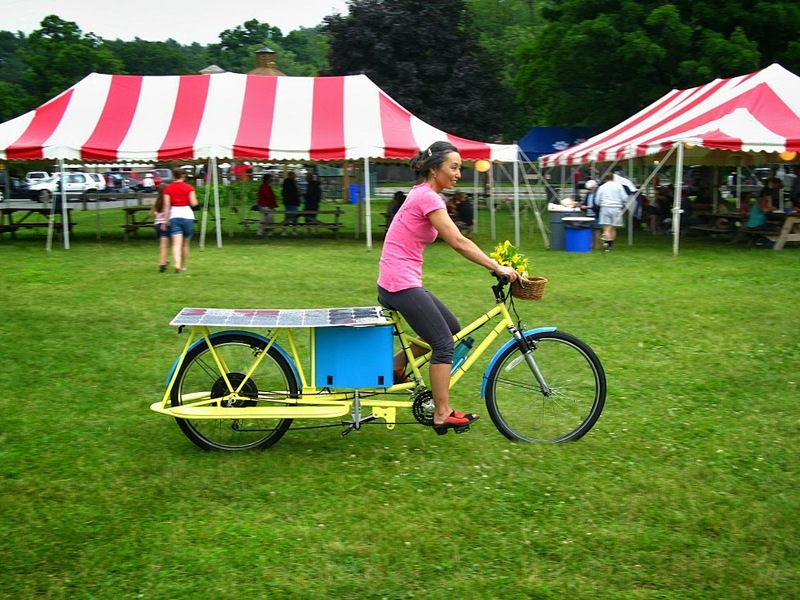 Since it is so hard to package a practical fairing onto a cargo bike, let's look at riding position. 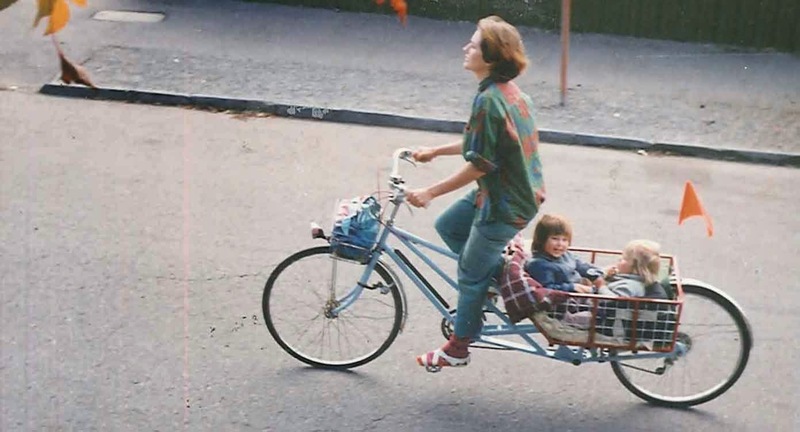 My upright Bakfiets is almost straight up and down, like an Oma (Dutch for Grandmother) bike. 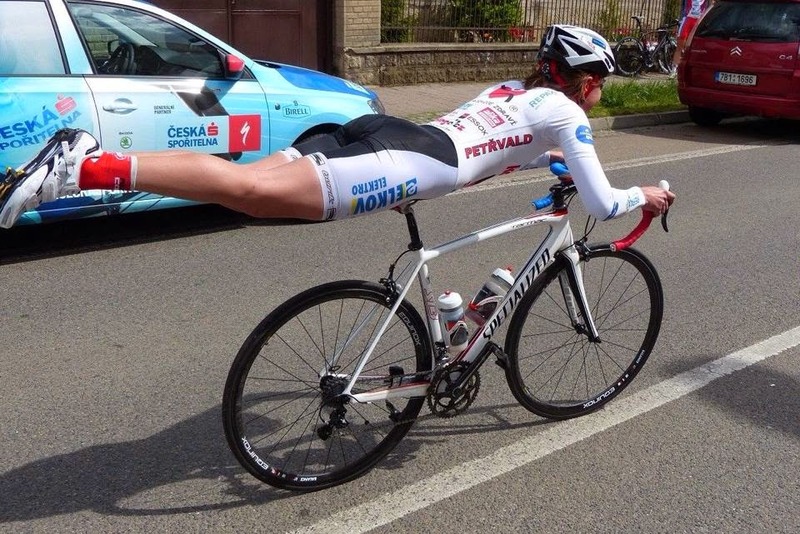 This is very comfortable and has great vision, but is not good for aerodynamics. Leaning forward for racing reduces frontal area, and adds the use of gravity to a good leg angle for pushing, but it is hard on the neck, arms, wrists, and back of riders who may have arthritis or injuries, and the seat height isn't good for stop signs. Moving the seat backwards and down also reduces frontal area, lowers center of gravity, and is a comfortable natural chair posture that allows both feet to be flat on the ground at stops, with the disadvantage of not being as effective for power production up hills. 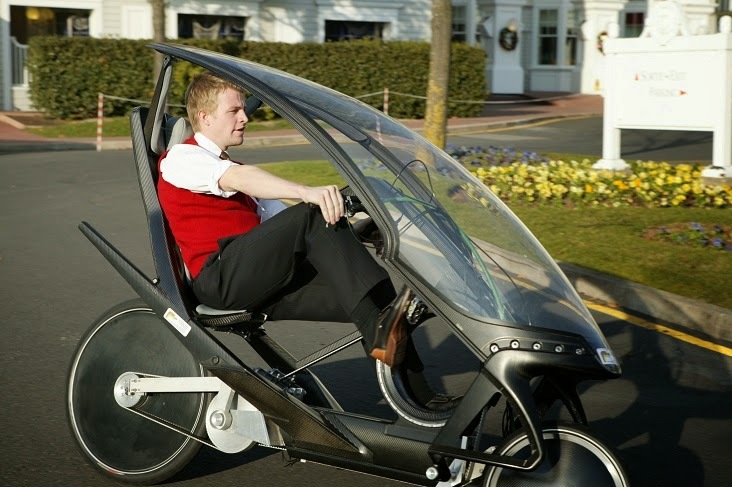 If the bike is designed with an electric assist in mind, power becomes less of an issue. 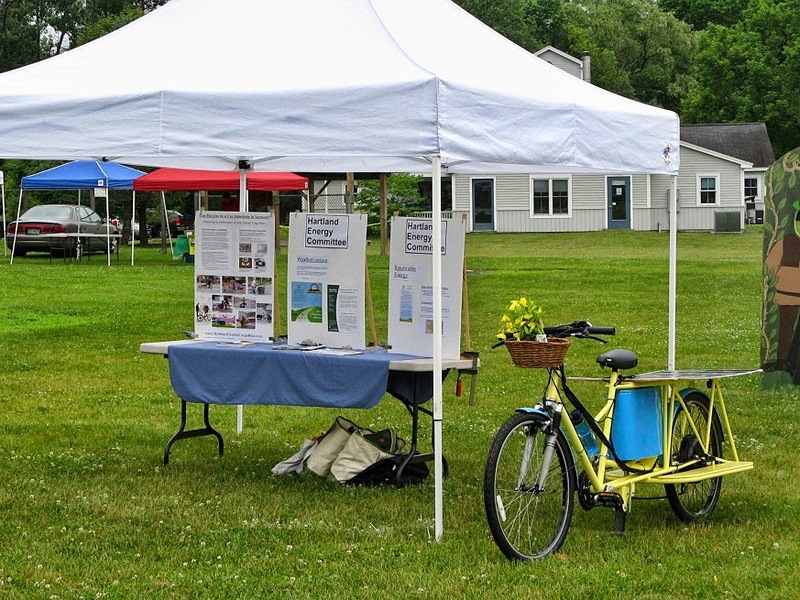 I've had over a dozen people tell me they could not test ride the Bakfiets because they were not able to sit on a bicycle seat. 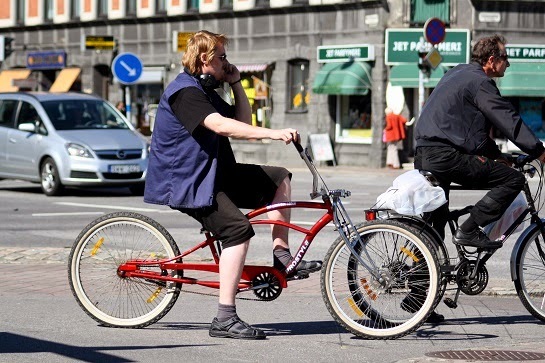 The narrow bicycle seat necessary to fit between the thighs for a forward leaning bike leg angle would also be uncomfortable for most riders over longer distances. 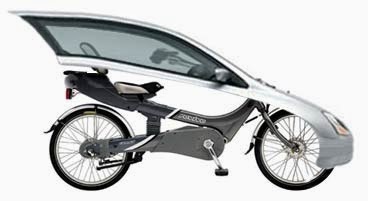 However as the leg angle from crank to seat is leaned backwards the rear part of the seat can be made wider for better hip support without interfering with leg movement, with the extreme example being the sling seats used on recumbents. I also know from motorcycle experience years ago that there were many shorter people, mostly women, who preferred the lower Honda Rebel 250/450 motorcycle seat height over a regular motorcycle seat. RANS calls their bicycle version of this Crank Forward, other bike makers have named them Feet Forward, and there is the historical term SofaCycle. 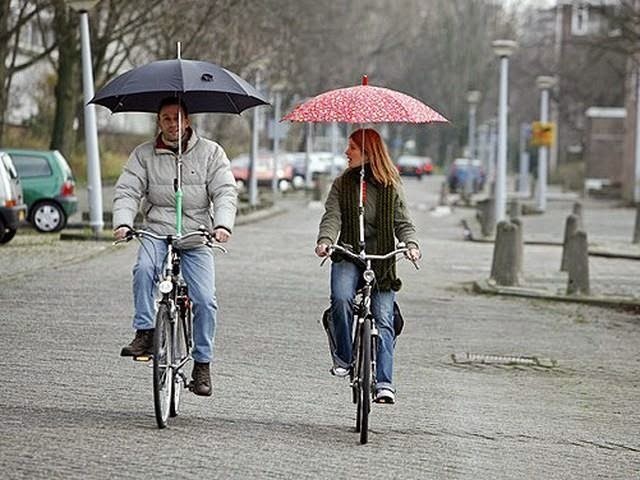 stub seat post so that a standard front shifting mechanism can be used. If laid out well it is still possible to stand up on the pedals for hills. the front and rear wheels attach on only one side. (one rear chainstay, or about 15", longer), and the whole fits together very nicely. and have either a pronounced forward lean position or full air resistance. upright position, so that it diverts air away from the pocket formed by your body. lean forward and tuck in behind it for coasting down hills. protecting hands and lower extremities from cold air, and keeping the load dry. All corners could be smoother. Photo credit: Unknown, probably Portland area. injuries during accidents. Even a small radius helps. The bolt on aerodynamic aids above will still allow cargo loads. 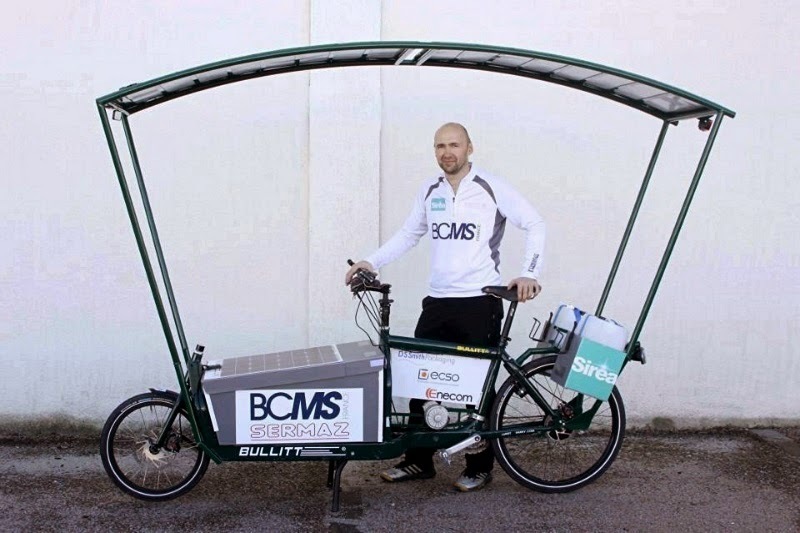 They are all leading surfaces, as I think that on a cargo bike the air flow is guaranteed to be turbulent, and a trailing edge device will have limited effectiveness. They will offer some cold air protection, but only a little water protection. 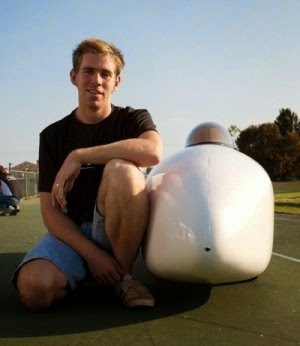 The next step up would be a semi enclosed bodywork, halfway between a regular bike and a velomobile. 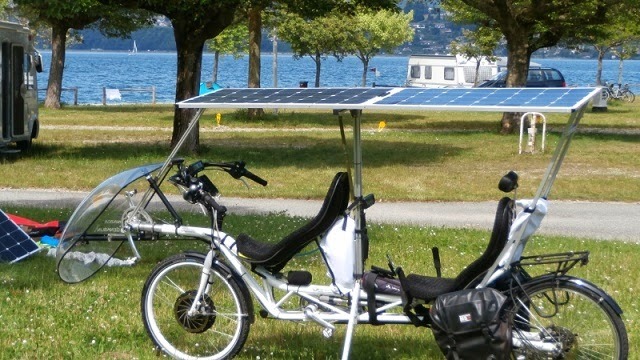 Several of the bikes on The Sun Trip during the summer of 2013 used solar panels as a canopy overhead, including several recumbents, however most were not particularly aerodynamic, and some of them probably had a poor reaction to crosswind gusts. 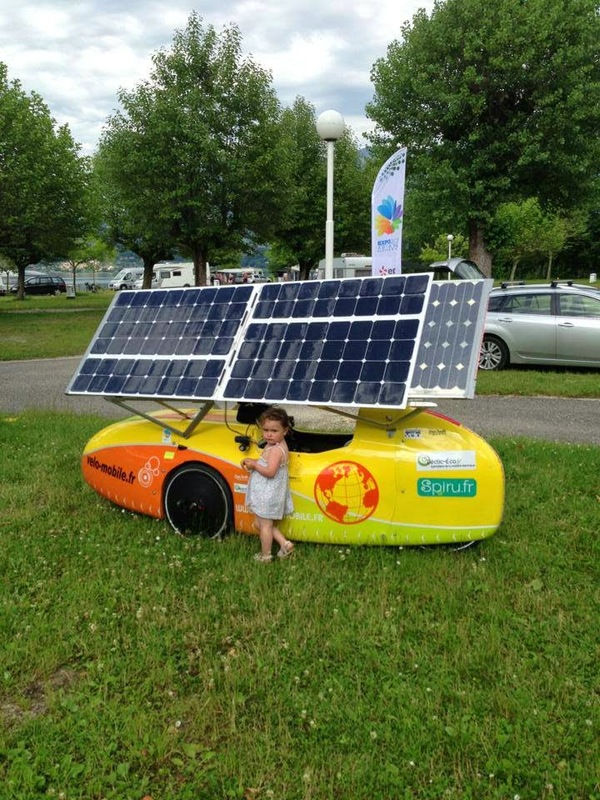 Team Declic Eco, Angélique and Guillame used a solar canopy and front fairing. was Raf Van Hulle's Bilenky (or Hase Pino?) 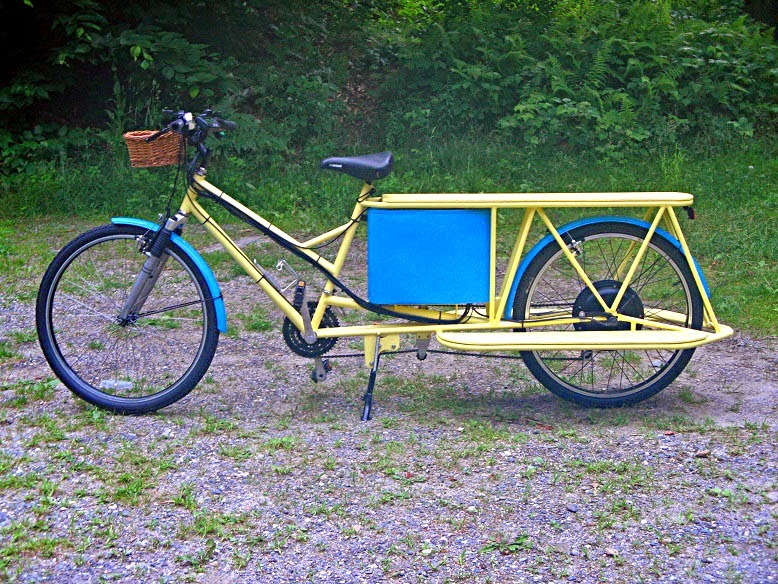 framed front cargo bike and trailer. and then the 2 removable panels snapped over the 2 fixed panels for traveling. I estimate these are about 125 watt panels, for a total of 250 watts moving, or 500 parked. The front panel could be angled left to right. Raf used a direct drive rear hub motor. 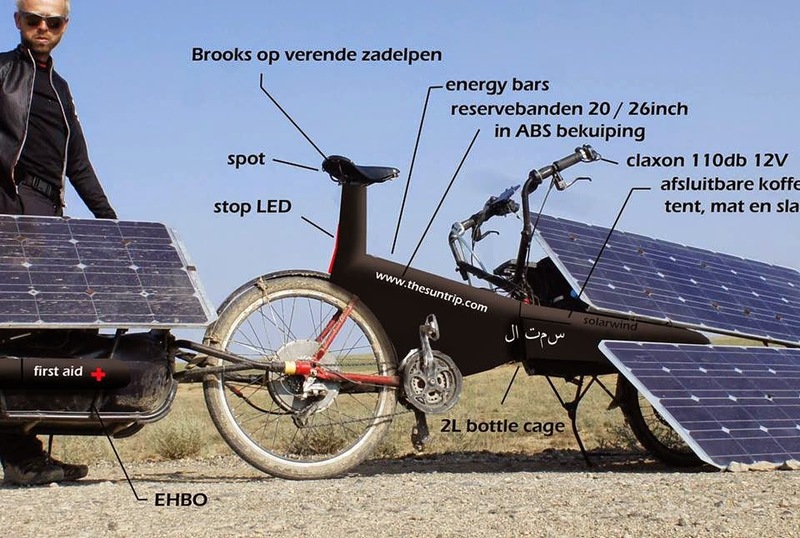 Added 23 August, 2014: Raf Van Hulle's ideas for his 2015 bike. Performance comparisons of the Sun Trip bikes need to be done carefully because of external factors. For example the direct drive hub motors (but not mid drive kits) could probably be run above the 250 watt limit if the country allowed it, as most of those motors have insulation good enough for 300 to 500 watts or more. Then it becomes a question of the motor controller's abilities to change parameters, the battery and panel capacities, and driving strategy: If the weather forecast calls for a cloudy period during the day, should the beginning speed be slow to save the batteries for the cloudy interval, or should it be fast while the sun is out and then revert to pedaling during the clouds? What if the cloudy period then turns out better or worse? It's not a straight forward comparison. 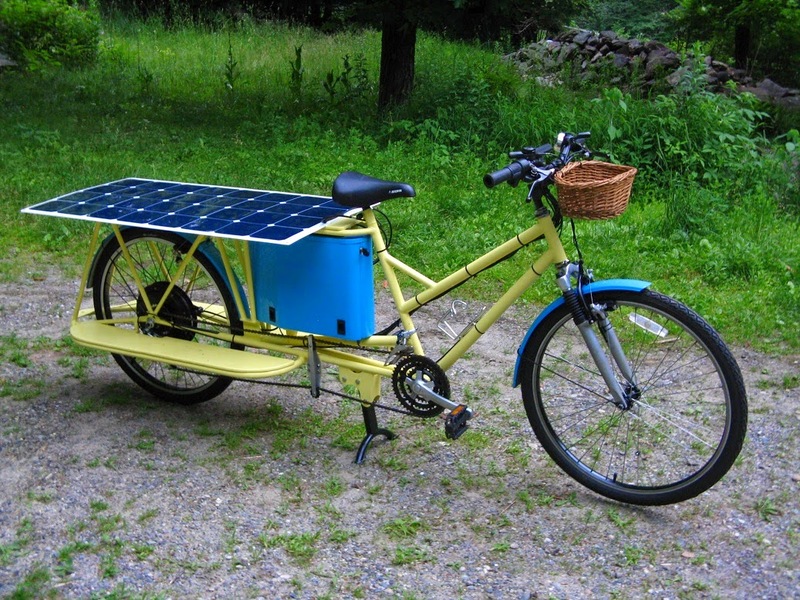 A more enclosed bike with a solar panel canopy could reduce it's frontal area by moving the seat to the rear to lower it, and then adding another panel over the pedals like a Bilenky style cargo bike rack. 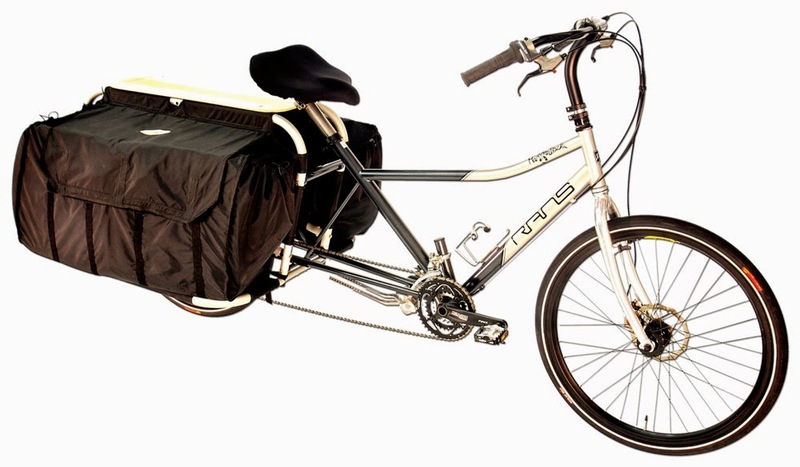 The question for me is how much lowering is possible, without becoming a recumbent and losing some of the cargo carrying ability? I will do some mock ups to test this with the third bike. 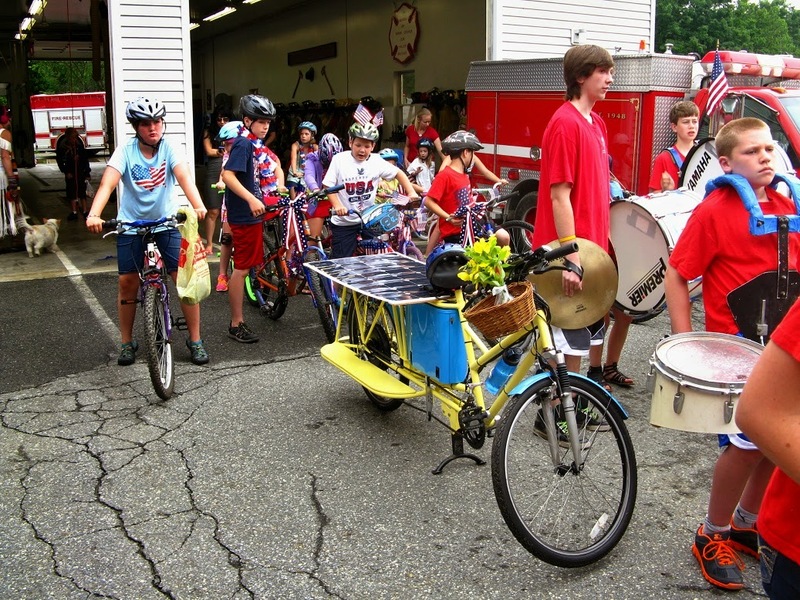 The new solar electric cargo bike Longtail was in the 4th of July parade. I'm going to post some of the pictures, and then follow up with a few more posts of pictures taken while building it. 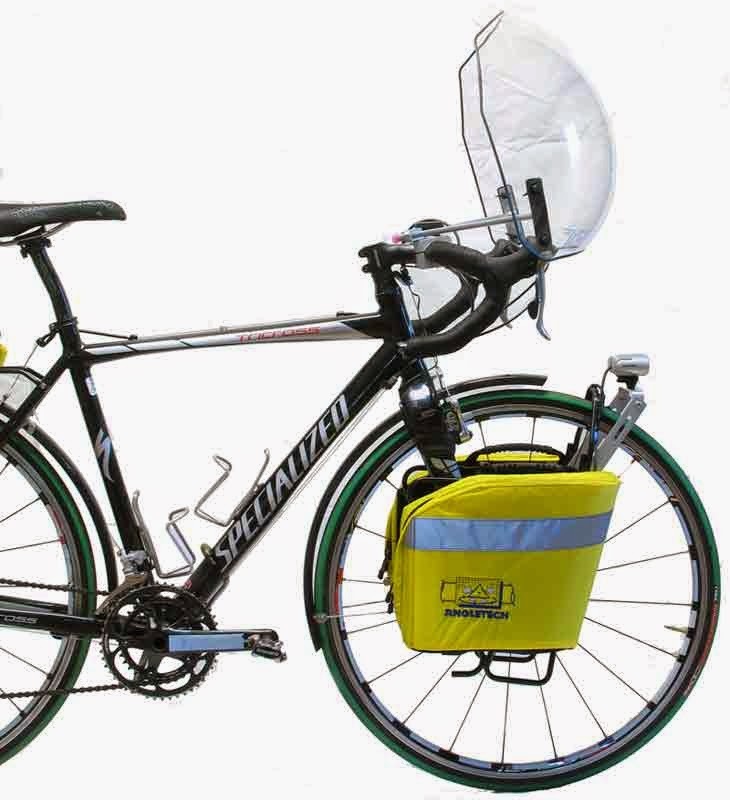 The basic frame is a Longtail with a battery box in the center and rack on the back. over cargo bags, and also be removed for carrying people or large packages. committee privilege and wait for a few other groups to go by, and then start out. It's OK, as long as I'm in front of the horses. 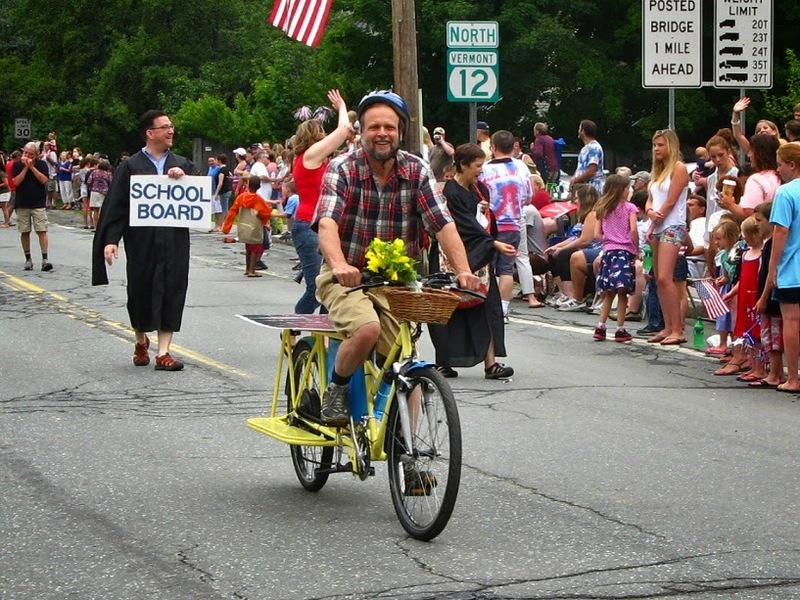 A lot more fun than the School Board, and no school budget discussions either. The first test ride on the Longtail. Chiho's comment was "that has a lot of power!" to start loaning it out for longer trials while I test the Longtail. 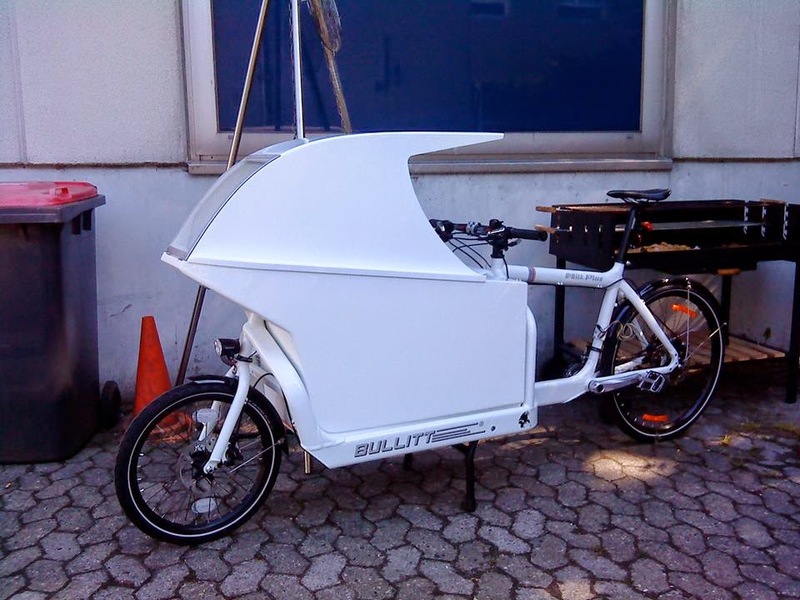 I'm not going to say much more about the Longtail until I've done 10-12 rides to be sure that the numbers are consistent, other than to say the Longtail seems to be a bit faster than the Bakfiets, and also use more power. The direct drive motor also idled along at a 4 year old's parade walking speed nicely (about 2 mph). An experiment will have to be holding the speed equal and seeing if the energy use becomes equal. 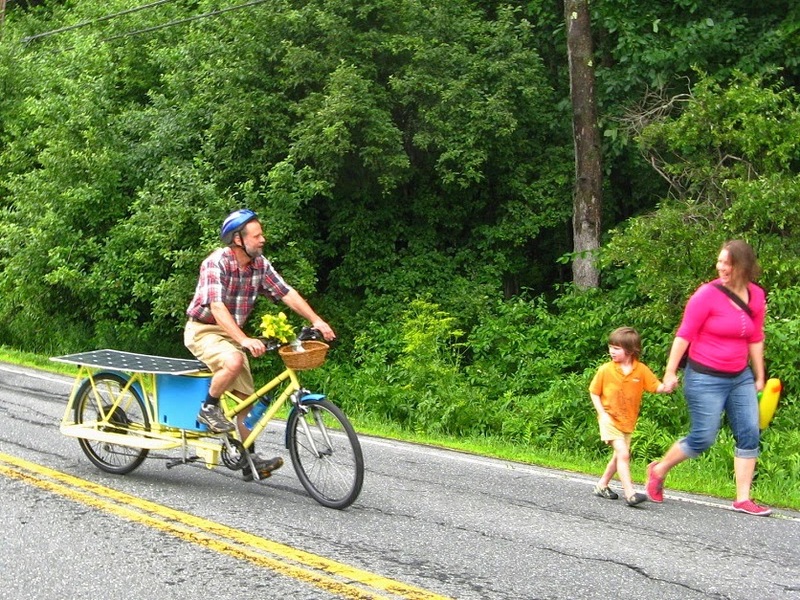 It is also much different riding at the front, after being way at the back of the Bakfiets for the last year. 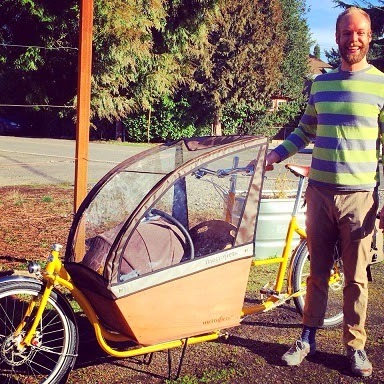 In a review of the 8 Freight cargo bike, the tester mentioned a distinct feeling that he was moving sideways when turning, and this bike is similar. On the Bakfiets it was more like watching the front end pivot around the rear wheel.